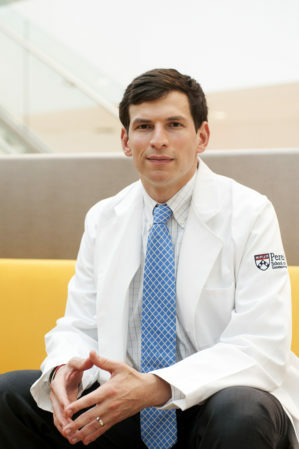 After Dr. David Fajgenbaum, WG’15, was diagnosed with Castlemann’s Disease while in medical school, he decided to come to Wharton to gain an MBA as a tool against the business problems getting in the way of medical research. Ever since I received my last rites in November 2010, I have considered myself in overtime. During my third year of medical school, I became ill with a rare and deadly disorder called Castleman disease. This disease causes the immune system to attack and shut down vital organs and strikes over 5,000 people of all ages each year in the United States. As a result, I experienced multi-organ failure and spent over four months in the hospital. Since that first experience, I have had life-threatening relapses requiring combination chemotherapy every 15 to 17 months for the last four years. After nearly dying, I returned to medical school on a mission. I began to conduct research into the causes and mechanisms of this rare disease, and I quickly observed that the greatest hurdles in the way of finding a cure were actually not medical problems — they were business problems. I found the lack of an overarching strategy, very limited collaboration, and inefficient spending slowing down progress towards a cure. I decided to go to Wharton to pick up the business skills I needed to overcome these hurdles and save my life along with thousands of others before my overtime ran out. To do this, I established the Castleman Disease Collaborative Network in 2012 and began applying business principles to accelerate research. Let me tell you how we’re different. In the traditional model, research organizations first raise money and then invite individual researchers to apply to use that funding how those researchers see fit. We completely reversed that process. First, we built a global community of 288 researchers, then we crowdsourced among that expert community to determine the highest priority projects, and finally, we recruited the top researchers from around the world to conduct those projects. In parallel, we have connected and supported over 5,000 patients/loved ones and forged partnerships with major industry and academic organizations. Our research has flipped the previous understanding of Castleman disease on its head. We used to think enlarged lymph nodes were the cause of all the problems, but we found that the enlarged lymph nodes are a result of the activated immune system. Therefore, rather than needing chemotherapy to kill the lymph node “tumors,” we can consider using targeted therapies and other immunosuppressants to interrupt the immune system. I certainly could not have accomplished our progress alone. In fact, we would have made less than 1% of the progress that we have if it had just been me. The success of CDCN is directly tied to the talents of my classmates, the environment on Wharton’s campus that fosters social impact, innovation, and entrepreneurship, and our unique approach. Over my two years at Wharton, my classmates have demonstrated time and again that they have also found their equivalent of Castleman disease to drive them — whether it be impact investing, health IT, or launching an annuities start up. To my surprise, many heard my story and joined me by donating their time and talent to the organization. Twenty of my classmates have spent over 3,000 combined hours volunteering on the CDCN leadership team and another 200+ classmates donated funds to our organization—I cannot express in words just how grateful I am for their support and involvement. Together, we grew the CDCN into a truly-Wharton initiative that applies business principles to accelerate research. To help fund these studies, Andrew Towne, L/WG’15, Kathy Feeney, WG’15, Aleksas Juskys, WG’16, and Alex Burtoft, WG’15, joined together with Wharton student leaders, including Alana Rush, WG’15, and Ted Sands, WG’15, to create the Knock Out Castleman Disease Campaign, which has raised over $40,000 — enough to fund one of our five top priority research studies. Though our need is still great, this is a huge step for us. Steven Hendricks, WG’15, applied core marketing materials to create an online patient community and engage more than 5,000 patients and loved ones. Emily Balmert, WG’16, organized the largest-ever meeting of Castleman disease researchers in San Francisco. Grant Mitchell, MD/WG’14, Chris Nabel, MD/GR’15, Jason Ruth, GR’14, and Ryan Vass, MD/WG’14, helped to secure a major partnership with a top pharmaceutical company to build a global patient registry. Sean Craig, WG’15, leveraged managerial decision making coursework and his former military training to help him lead the organization as Chief Operating Officer. Pat Morey, WG’16, and Tina Chong, WG’16, also leveraged their prior military experiences to assist with coordinating the transfer of tissue samples for one of our top priority research projects. And it’s not just students. Wharton’s leading administrators — Kembrel, Dean Howie, and Maryellen Lamb joined 40 students — many in spandex — to go through a Boot Camp 2 Beat Castleman’s workout led by Jonathon Sockol, WG’16. My time at Wharton officially came to a close on May 17, 2015, and I had the incredible honor of being the student graduation speaker. It was extra special, because I think so highly of my classmates. As I write this post, I am 17 months since my last life-threatening relapse and I have relapsed every 15–17 months for the last four years. I’m barreling toward the average life expectancy for my disease. But, I have more hope than ever. Our model has become a blueprint for accelerating rare disease research, our findings have completely flipped the previous understanding of Castleman disease on its head, and we’re learning how to better treat Castleman disease. In fact, right now I am on an experimental treatment regimen that is based on our research findings. We’re only one study away from unlocking which immune pathways need to be targeted to cure this disease. Thanks to so many of my classmates, I now have the team to do it. Thanks to my education, I have the business principles to guide us through overtime.